There's a wise saying in Spain that goes: Not two persons drink coffee the same way. It's not just that some people like it large and with just a little trace of milk while others like it exactly reverse, but also that our appetite for caffeine may vary as our day goes by. 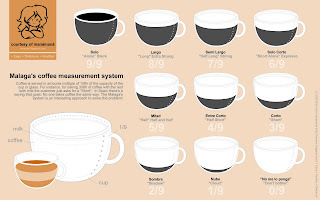 Coffee lovers try to avoid those coffee houses and cafeterias where, independently from how you ask for it, they serve coffee in their own standardized way, usually including awful coffee machines and blends. That's why I love cafeterias that are old and tiny, where usually the demography of old people is a good sign about the quality of the coffee served or, at the very other end of the table, places like Starbucks, where I can enjoy huge cups of Blue Mountain with soya milk or smoothies. But let's center in the main subject: there are many people out there, including me, who are really demanding when asking for a coffee; and probably Malaga (Spain) is one of the world's capital in the matter, because they have invented a wonderful system to measure the coffee served in order you get exactly the amount you want. Expresso or With Milk? In Malaga that's for amateurs! Some coffee houses and cafeterias have this system displayed in their walls to help newbies.